There are many people that record audio from their home, and it’s very possible for you to do as well. You’ll just need a few pieces of equipment and a special space, and then you can just dive in and do it. Here are some of the top tips and tricks for home recording, to help you out. You will need to have a special area in your home to record in. Some people like for this area to be away from everything else, even your computer, while other people do not. It’s completely up to you to decide where you want to do your recording and editing. You can even soundproof the area a little bit if you want to, but you don’t necessarily have to if sounds are not a big problem. You can read list after list online and you’ll see that others are very serious about their home audio recordings. They will tell you to get countless items and programs, and warn that nothing will sound good if you don’t. The truth is that you don’t need very many items to record audio that sounds great. 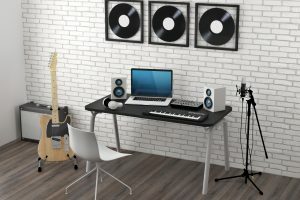 Essentially, you’ll need a fast computer, a microphone, speakers, a music instrument or something capable of making sounds, and a software program that is designed to help you edit audio files. You can build on this list as you do more recordings, or even utilize more than one type of editing program as you get more into this craft. When you are recording anything, you want to be in control of the sounds that can be heard at all times. This isn’t easy, but you’ll need to do your best. Make sure that you can’t hear things like people playing outside or an air-conditioner in the background of your files. This is imperative, since it is harder to cut out some sounds later. Another thing semi-professionals and professionals swear by is a proper microphone position. In many cases, a mic will not sound great right in front of you, so you’ll need to find the place where it sounds the best. Try placing it in multiple locations around the room, and record short clips. This way you’ll be able to tell where the sweet spot is and keep your mic there for future projects. You can’t just leave your music raw and expect people to like it as much as you do. This is why you need music editing software. Depending on what type you purchase, it can help you add effects, take out some of the noise, and even allow you to add other things, to make it sound better rounded. This type of software ranges from inexpensive to pricey, so start with one you know will be easy to use, as you can always purchase upgrades later. If you plan on recording whole music tracks at home, it is a good idea to come up with the melody, beat, or musical part first before you add in vocals or words. This will allow you to have a better cadence and flow, so the entire track is more cohesive. As soon as you see a problem that needs to be fixed, solve it. A lot of minor problems can lead to larger problems if they aren’t addressed in a timely manner. Additionally, sometimes there isn’t a way to solve problems later on, when they could have easily been corrected early in a project. These small problems can range from things like too much extra noise, sound aberrations, or musical notes that need to be removed. Do everything in an organized and timely manner for best results. This will also mean you won’t have to do a ton of extra work in the editing process. Don’t add enhancements and effects to your audio until after you record it. If you don’t end up liking these extras, there will be little you can do to change things. On the other hand, if you wait until after you have already recorded, you can easily take off any enhancements you don’t like and still have an intact audio file to keep working on. Even though you likely have a clear vision in your head of what you want everything to sound like, you may not be able to produce those results right away. There is a little bit of a learning curve with some of these products, and you’ll have to understand some of the basics of music in order to make something special. As you keep using these things and recording more audio, you will learn more than you knew when you started, which will help you with all your future work. In other words, playing around with the equipment you’re using and exploring all the different features and aspects will allow you to become more familiar with the items you’re using. This should have an overall positive effect on your recordings, and it will probably also be quite fun. There are many people who record in their homes, everything from podcasts to online videos. If this is what you want to do, you will just need to invest in the right equipment and become familiar with it. The process is relatively simple, and a lot can be done with an audio software program and the right computer; you’ll only need a few more tools besides that. Additionally, you need to have a space dedicated to recording, and you should be able to solve problems as they come up. Besides that, it’s just a matter of recording and enhancing your tracks, so you’ll become better at it and produce the best results that you can.